I am a wife and an IT Professional who works in a 24/7 project. My work may begin at 5 am in this hot summer morning, or at 12 pm or by 8 pm. My work is unpredictable like me and I have never compromised it for anything in life. When I got married and that too to a Defense Personnel, I was often been told that I should quit my job as he gets his posting and often shifts from one place to another every couple of years. More so, there are responsibilities to be undertaken as an Army wife too. Touch wood! I have a very understanding man in my life. There are times in my life when I get back home at 1 am and then sleep through the day. He hasn’t for one instance tried to wake me up at 6, 7 or even 8 am for his regular morning cup of tea. Neither has he expected me to wake him up with breakfast in bed. It was always the other way round. I was never expected to iron his uniforms till date nor apply Brasso polish in his already shining stars which he adorn in his shoulders. He has never till date asked me to do the same. There is mutual respect among us and we try to help each other through the chores each day. Blessed I am, ain’t I? Then you also ought to know that I was raised to be a respectful woman. My Mom works 150kms away from home. My Dad does the household chores along with my sister. In this fast-paced world, if you decide to tie your hands and stand back imagining the woman in your family doing all the chores, then you are sadly mistaken. I’m not saying that men SHOULD do ALL the chores. But, it also doesn’t pain to Share to Care. Apart from washing dirty dishes, I guess, washing laundry bags the second place in the worst household chores list. I remember those hostel days where I never had the luxury of a washing machine to do laundry. And boy oh boy, whenever I tried in one, I was made sure that it ruined my clothes to the extend that it is unrecoverable. 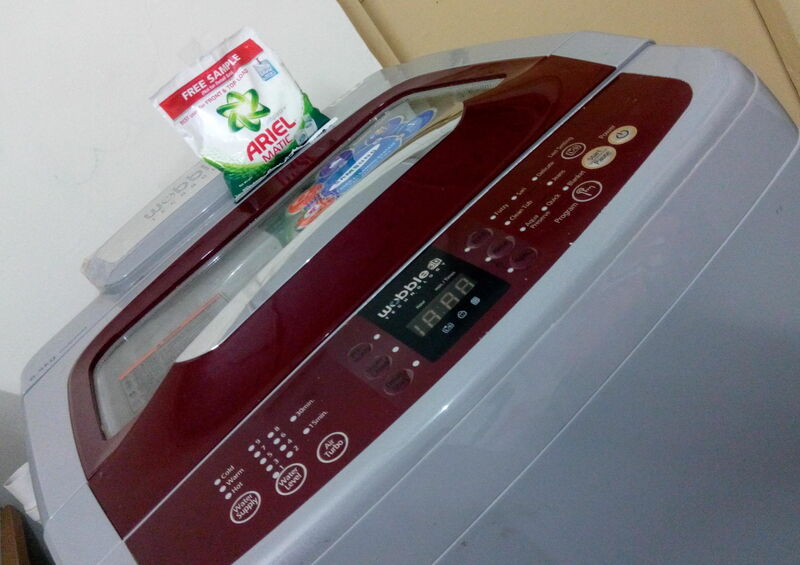 Having said that, when P and I decided to choose a washing machine and a good detergent to do the trick, we were suggested to try Ariel Matic. Hands down! Needless to say, we are a happy couple sharing the load of doing laundry together every Sunday and never having to worry about washing those jeans, uniforms, his formal suits, and oh yeah, the dirty collared shirts as well. #WashBucketChallenge has become a good platform aiming to demolish the norms set up in our society that it is a woman’s job to do household chores and that it is her primary responsibility. Ariel and Blogadda has joined hands to help women realize the message of sharing among couples. And we are more than happy to be selected so as to spread the message. Ariel Matic! Can be used by both Men and Women! 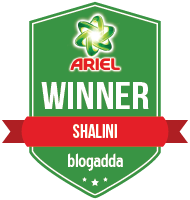 This post is a part of the #WashBucketChallenge activity at BlogAdda.com is association with Ariel India. Yay, Sid 😛 Same pinch! Dear Shalu a well brought up human being puts respect for others before anything else. Kudos to your husband for being chivalrous and helpful.